Holland Municipal Stadium, the home of Flying Dutchmen football since 1979, has undergone a transformation with the installation of artificial turf in time for the upcoming season. The stadium is owned by the City of Holland. 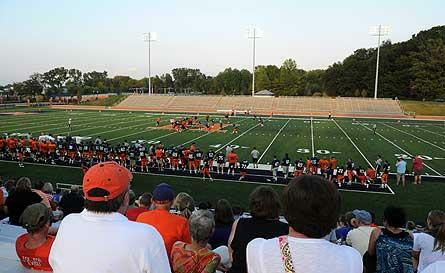 Hope College and the city have entered into an agreement that would allow the college to acquire the stadium. Sharing memories of the past and visions of the future of the stadium in the video below are Brian Davis, Superintendent of Holland Public Schools and Dr. James Bultman, President of Hope College. They are interviewed by Greg Robinson, the Assistant City Manager for the City of Holland. Also included in this 40 minute video is Tom Renner, Director of Public Relations for Hope College.